The indications of the system's presence are the letters "SRS AIR BAG" or “AIR BAG" embossed on the air bag pad cover in the steering wheel and the passenger's side front panel pad above the glove box. The advanced SRS offers the ability to control the air bag inflation within two levels. A first stage level is provided for moderate- severity impacts. A second stage level is provided for more severe impacts. 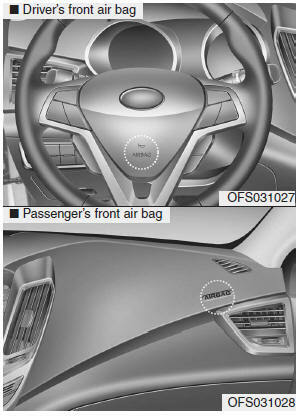 According to the impact severity and seat belt usage, the SRSCM (SRS Control Module) controls the air bag inflation. Failure to properly wear seat belts can increase the risk or severity of injury in an accident. • You and your passengers should never sit or lean unnecessarily close to the air bags. Improperly positioned driver and passengers can be severely injured by inflating air bags. • Do not allow a passenger to ride in the front seat when the PASS AIR BAG "OFF" indicator is illuminated, because the air bag will not deploy in the event of a moderate or severe frontal crash. • Never place covers, blankets or seat warmers on the passenger seat as these may interfere with the occupant classification system. • If the SRS air bag warning light remains illuminated while the vehicle is being driven, have an authorized HYUNDAI dealer inspect the air bag system as soon as possible. • The SRS is designed to deploy the front air bags only when an impact is sufficiently severe and when the impact angle is less than 30° from the forward longitudinal axis of the vehicle. Additionally, the air bags will only deploy once. Seat belts must be worn at all times. • Front air bags are not intended to deploy in side-impact, rearimpact or rollover crashes. In addition, front air bags will not deploy in frontal crashes below the deployment threshold. • Even though your vehicle is equipped with the occupant classification system, do not install a child restraint system in the front passenger seat position. A child restraint system must never be placed in the front seat.The infant or child could be severely injured or killed by an air bag deployment in case of an accident. • Sitting improperly or out of position can result in serious or fatal injury in a crash. All occupants should sit upright with the seatback in an upright position, centered on the seat cushion with their seat belt on, legs comfortably extended and their feet on the floor until the vehicle is parked and the ignition key is removed.